Who? Priestly poeticizer Gerard Manley Hopkins. What? A good two dozen of his wacky little verses, with a dollop of journal entries on the exit. When? Published as part of Penguin’s mini black classics series in 2015, though Father Hopkins wrote privately in the late 1880s. Despite this he was not published until 1918, after his death, so he has no idea anyone’s actually reading him. How? How to describe, decry or deny the dibbling, dabbling, scribbling scribe a well-dappled style, replete with conceit, linguistical tongue-twistical feats now obsolete, a hip priest, so to speak – the flair, the flair? Yes, he writes like that all the time. Why? Hopkins’ verse must count amongst the most vibrant modern religious poetry. The energy created by the bounding, barmy internal rhyme can only be experienced when read aloud, preferably in a Richard Burton voice. Failing that Anthony Hopkins will suffice. 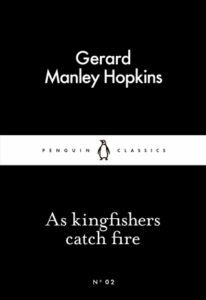 As kingfishers catch fire is available as a Penguin Classics paperback.